Dr. Steven Greer, the father of the Disclosure Movement, has for years been gathering military, government and industry witnesses to UFO activity and the development of New Energy systems. In this lecture he will update you about what continues to be happening world-wide about Disclosure – including a discussion of its promise and pitfalls. The CE-5 teams (Human Initiated Contact Teams) are burgeoning around the world. The CE-5 Initiative has as its central focus bilateral ETI-human communication based on mutual respect and universal principles of exchange and contact. CE types 1-4 are essentially passive, reactive and ETI (Extraterrestrial Intelligence) initiated. A CE-5 is distinguished from these by conscious, voluntary and proactive human-initiated or cooperative contacts with ETI. Evidence exists indicating that CE-5s have successfully occurred in the past and many with the CE-5 Contact Teams. 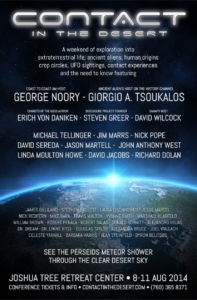 Dr. Greer is training people to develop a mature relationship between Humans and ETI. He will share some of the teams’ experiences with you along with ideas about how you can make peaceful contact with Extraterrestrial Beings and why that is important.